Tags: fifth grade, first grade, fourth grade, homeschool, Keyboarding, Kindergarten, online websites, safe internet, second grade, teacher resources, third grade. Bookmark the permalink. Was Typingweb.com considered? This web site offers teacher interaction features for free in which you can also tract your students progress. I used this website with my middle school students. It is a great tracting tool to monitor what your student can do and the progress they are making in their keyboarding skills. That’s a wonderful program. I don’t think I’d discovered it at the time I put this list together. Thanks for adding it. I also use typingweb.com for grades 3, 4, and 5 (K, 1, and 2 use Dance Mat Typing). It gives instant feedback to the students and myself. I can spot the student who is not on task immediately by checking their “typing time” as they are typing. Each week I post the list of all typists’ Net Typing Speed, high to low and let the competition ensue! The principal also announces the top 5 typists each week. This program is excellent! That’s a great one–Typing Web. I’ve started recommending it to students when they are bored with DanceMat. It’s as effective as Type to Learn, though not quite as fun. I love that your principal is supportive of the typing program. That is so important. I’ll check it out. Thanks, Sue! We will be off the internet grid this summer so I’m looking for keyboarding software that we can use on our laptop for our 11 year old. Ideas? Type to Learn can be downloaded. I love that program. It worked nicely with my students. BTW, this blog has moved to http://askatechteacher.com. Feel free to get daily updates there. I’m teaching an emerging writers class this fall in a homeschool co-op for grades 1-3. I want to introduce blogging second semester. I was looking for some thoughts on whether or not keyboarding would help students to be independent writers. Kids will be using a variety of devices…tablets,pads, laptops and desktops. My current thought is to suggest to parents to begin a keyboarding curriculum in the fall and that way students are more prepared for independent blogging come spring. Your thoughts?? Absolutely. Otherwise they’ll spend far too much time trying to find the keys, which will ruin their writing train of thought. This article is pretty old so there are new items out there–Typing Web, Typing Club. Even DanceMat Typing is good for short-term. 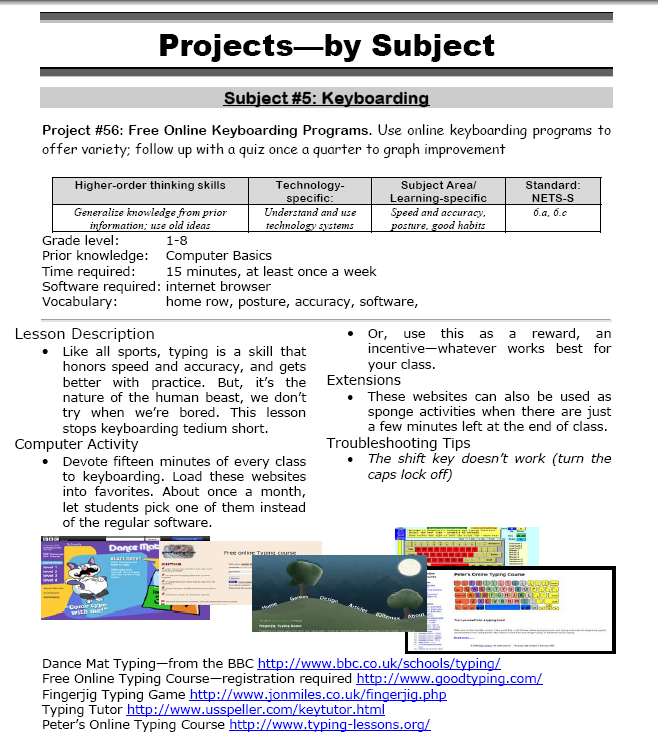 I’ll be starting an online keyboarding program in the fall–2 videos a month, provided two hours a month of training. That might interest some of your students (offered over here). For more on keyboarding, please visit my blog’s new home at http://askatechteacher.com. I am working on finding new software for the keyboarding class that was placed in my schedule this year. I am going to give typingweb.com a try. So far what I see it will be perfect and you can’t beat the cost. Typing Tutor and Typing Club are both great. The only bad I’ve heard about Typing Tutor is the ads are sometimes questionable. I invite you to switch to Ask a Tech Teacher’s new home at http://askatechteacher.com. I don’t update this site anymore, but leave it as a resource. I have lots of info on keyboarding at my new home!